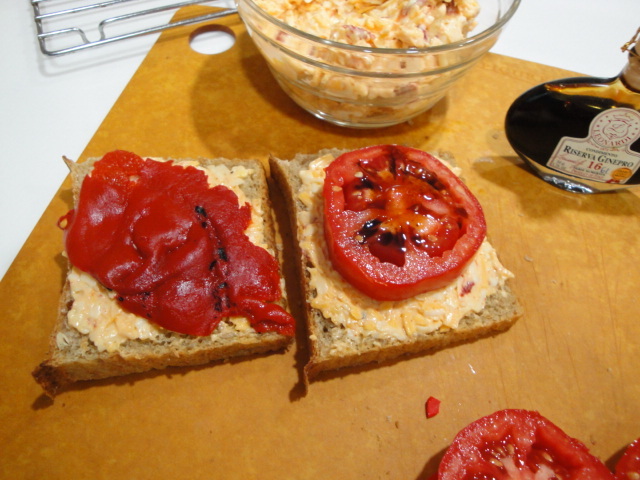 Before the season ends and I’m back to canned tomato products, one of the things on my summer must eat list is a simple Toasted Pimento Cheese & Tomato Sandwich. 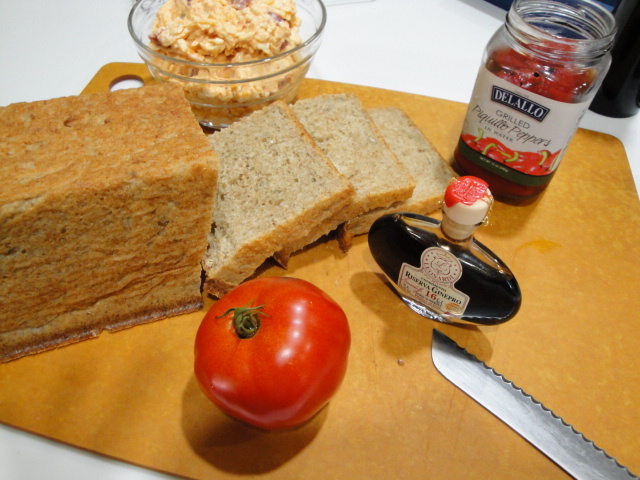 Some hearty bread, good pimento cheese and a thick slice of vine-ripened tomato are all that’s required for a satisfying lunch or dinner. Recently I made the food for a fairly large wedding shower/cocktail party. It was pretty exhausting and made me realize how much caterer’s should be appreciated when they make food from scratch rather than relying on commercially produced stuff to fill their orders. 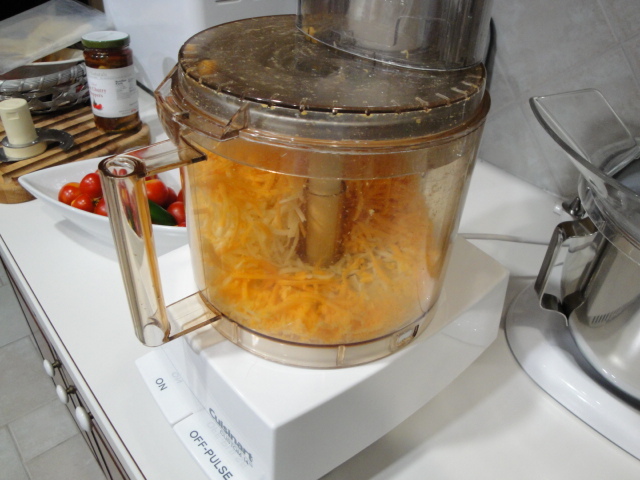 Good food doesn’t need to be fancy or fussy but it does need to be fresh and prepared with high quality ingredients. So it wasn’t so surprising to me when one of the most commented on items on my menu was a simple Pimento Cheese Spread served alongside toasted baguette and celery sticks. So much easier to prepare than the fussy Watermelon Gazpacho with Feta Crema served in martini glasses, and the second bonus was that there were leftovers to be enjoyed the next day while cleaning up after the party. 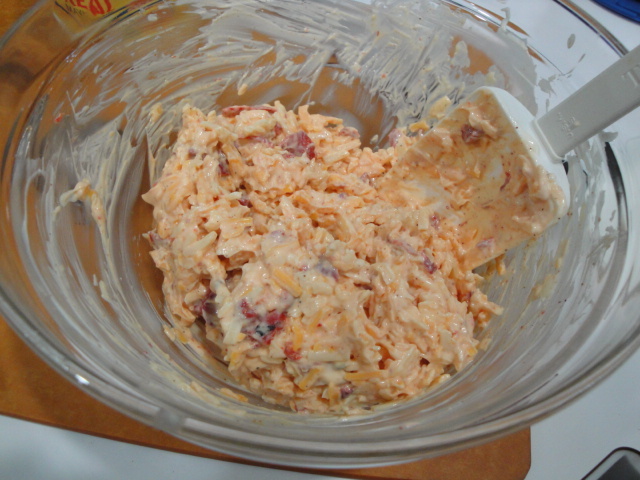 Pimento Cheese Sandwiches were one of those things I grew up with and found to be just an ok kind of thing, but it was often made with pasteurized processed cheese, salad dressing, generic canned pimento peppers and slathered onto what I have come to refer to as Wonder Fluff. It wasn’t until I grew up and discovered aged cheddar cheeses, mayonnaise and roasted Piquillo peppers that Pimento Cheese became one of those ” sometimes” foods to be savored. A sometimes food because ,it’s not low in calories, saturated fat or sodium for sure, but for an occasional meal with homemade whole grain bread and a thick slice of tomato I’ll make the sacrifice and cut those calories somewhere else. In the past I’ve made this sandwich as a “Grilled” sandwich, meaning that in addition to the fat from the cheese and mayonnaise I added butter to mix as in a Grilled Cheese Sandwich. 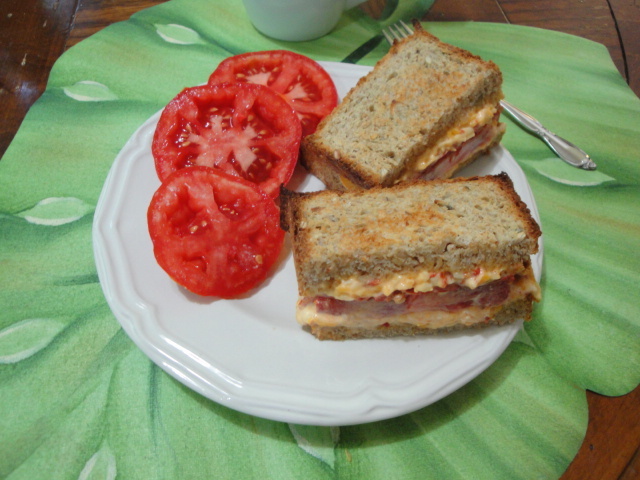 So as at least a small nod to cutting a bit of the saturated fat in the sandwich, I decided to simply toast the bread and build the sandwich with modest amounts of my lovely Pimento Cheese and an extra thick slice of tomato. Funny thing is, I think I liked it even better than my old stand by. I don’t think it will make it to the pages of Cooking Light but every calorie saved is one I don’t need to burn. 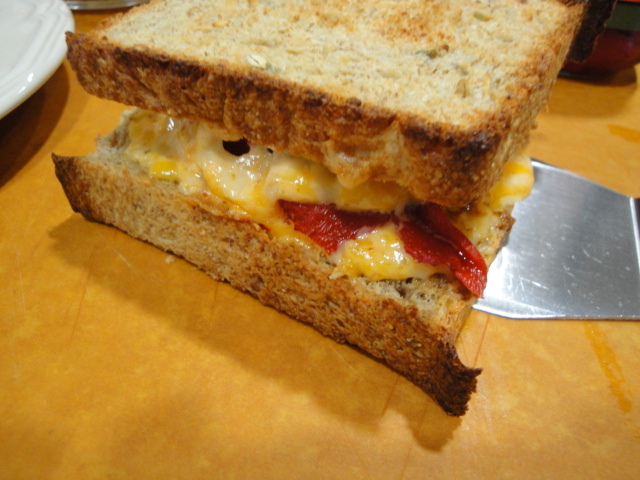 The inspiration for this recipe was Pimento Cheese Toasts that appeared in the January 2008 issue of Gourmet magazine. I’ve used it for New Year’s Eve and Derby Day parties in it’s original form and then as a cold spread as I mentioned as an easy make ahead item for a cocktail party. This week I’m just enjoying it made into a sandwich with tomatoes or on toast with a slice of tomato for breakfast. The ingredients for the spread are simple so the quality really counts. I use a combination of sharp or extra sharp (aged) white cheddar (Cabot Vermont is one of my favorites) and sharp or extra sharp yellow cheddar. White pimento cheese would just seem weird, so the combo gives me the color I want with the great flavor of an excellent white cheddar. I’ve replaced the cayenne pepper in the original recipe with chipotle powder and the generic roasted red peppers with roasted Piquillo Peppers. 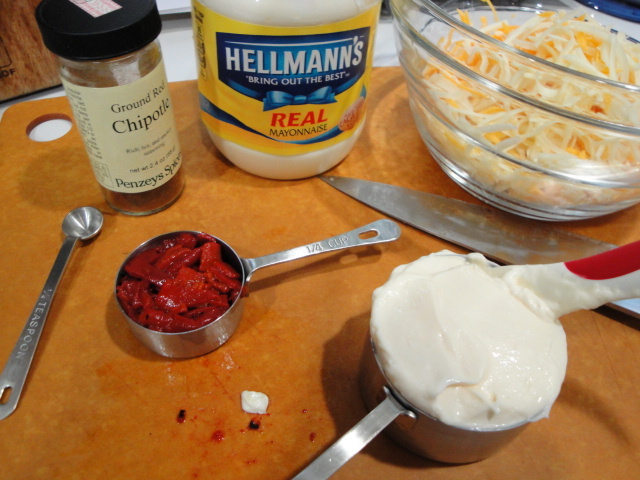 Only Hellmann’s Real Mayo makes it into my refrigerator. 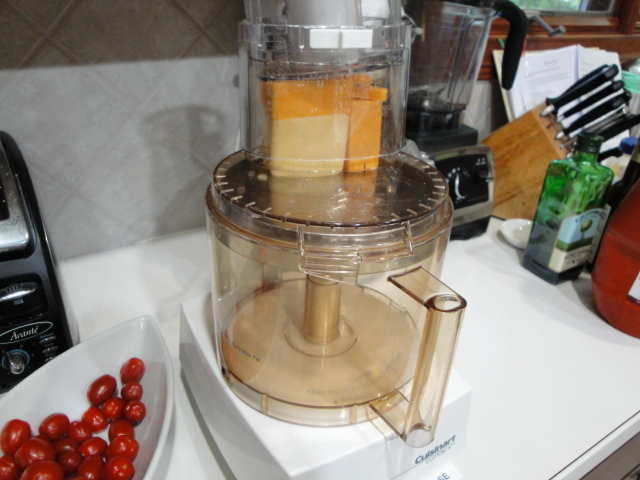 When I’m grating this much cheese I pull out the food processor and the coarse grating blade. 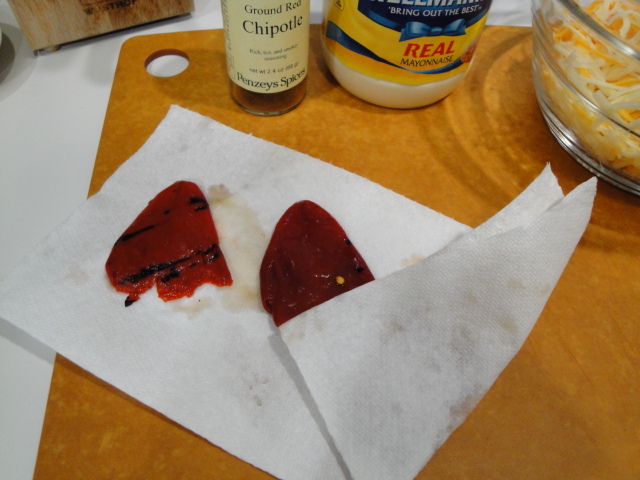 Two piquillo peppers with give you approximately 1/4 cup of diced pepper. If you love the flavor feel free to add a bit more or you can do as I will and add more to the sandwich. 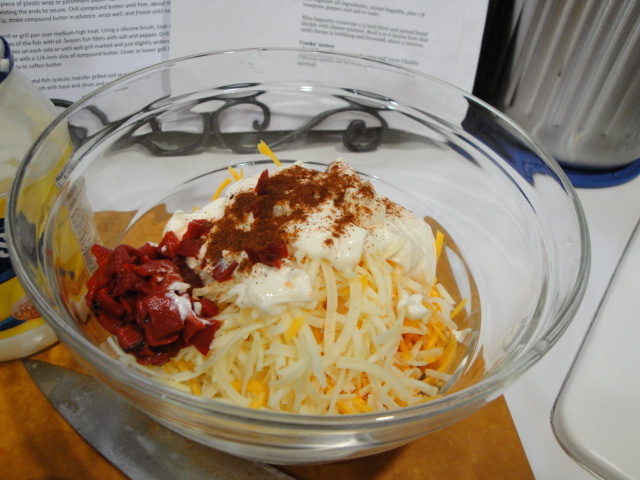 Mix the cheese, mayo, peppers and chipotle or cayenne pepper ( if you like it spicy up the amount to 1/4 teaspoon or more to taste). It needs to sit in the refrigerator a bit to allow the flavors to blend, but it’s essentially party ready as a lovely spread at this point. Now I’m ready to build my sandwich. This week I was ambitious and made my own bread (Harvest Wheat from the King Arthur website and baked in a Pullman pan so I have great sandwich slices. More piquillo pepper patted dry, a thick slice of vine ripened tomato and a splash of awesome Lombardi Balsamic Vinegar. 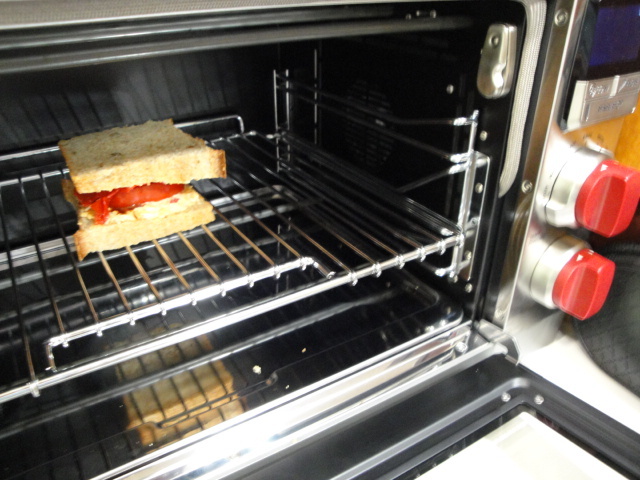 I have a new toy in my kitchen (a Wolf countertop oven that works as a toaster) that makes making a toasted sandwich super easy. The bread toasts and the cheese gets just slightly warm. If you simply toast two slices of bread and work quickly you can achieve nearly the same effect. Or you could dry toast the sandwich in a skillet. Toasted bread and warm gooey cheese-oh yum! 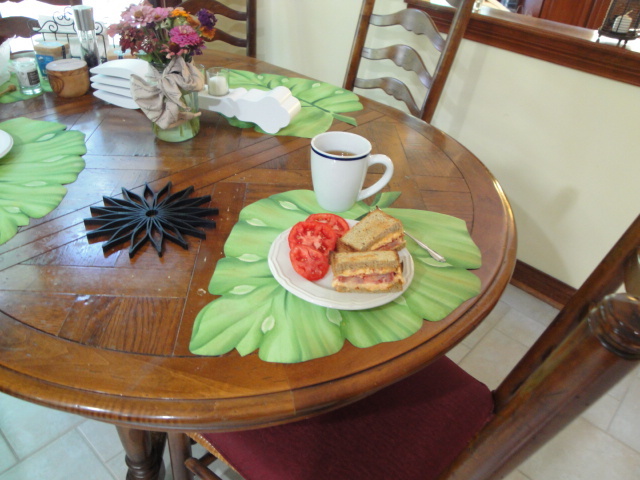 All I need for lunch is a few more slices of those luscious vine ripened tomatoes from my garden. 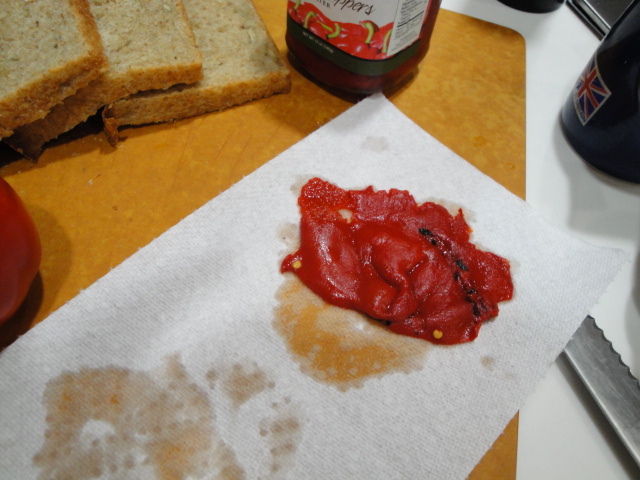 ¼ cup finely diced roasted Piquillo peppers, patted dry before dicing. Mix all ingredients and refrigerate until ready to serve. Serve with celery stalks or toasted baguette slices or spread on baguette slices and broil until the cheese is bubbling and browned.